The Times (29/7/18) picks up on the Bevins and Ixer paper below to tie in the Altar Stone to the A40 route of bluestone transport. At the heart of Stonehenge lies a six-tonne riddle. The Altar Stone is formed from a purplish-green sandstone that is unlike anything else on the site. Archaeologists believe the stone was hauled to Salisbury Plain from the Welsh borders by crossing up to three rivers. It raises the possibility of a Stone Age highway for megaliths stretching from Pembrokeshire to Wiltshire. The larger sarsens come from nearby Marlborough Downs and the smaller bluestones from the Preseli mountains in Pembrokeshire, but the sandstone of the Altar Stone is foreign to both areas. 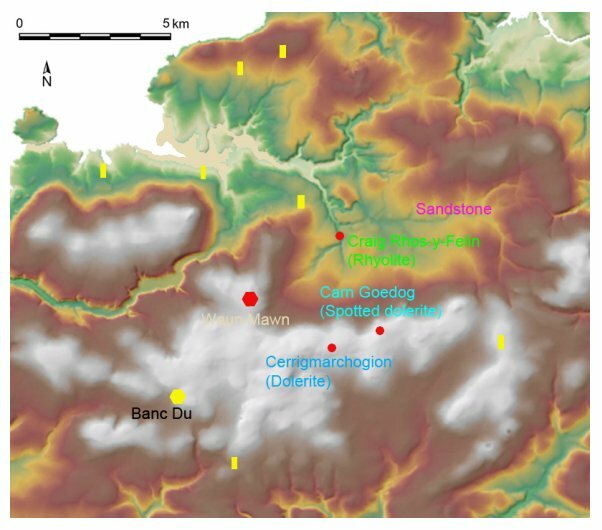 Rob Ixer, of the University of Leicester, and Richard Bevins, of the National Museum of Wales, say it was “very probably” quarried from the Senni Beds, a formation of sandstone from Llanelli to Herefordshire. 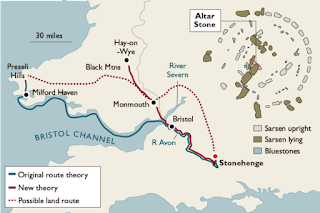 Getting it to Stonehenge would have involved hauling it down to Monmouth and the lower reaches of the River Wye with oxen and skids or rollers; then negotiating the River Severn, either near Gloucester and going south to Wiltshire, or taking a raft down the river and across to the mouth of the Avon. Dr Ixer and Dr Bevins’s idea could overturn the established theory of how the bluestones found their way from west Wales. It suggests that the bluestones may have been carried not by water, as the geologist Herbert Henry Thomas thought a century ago, but by land. 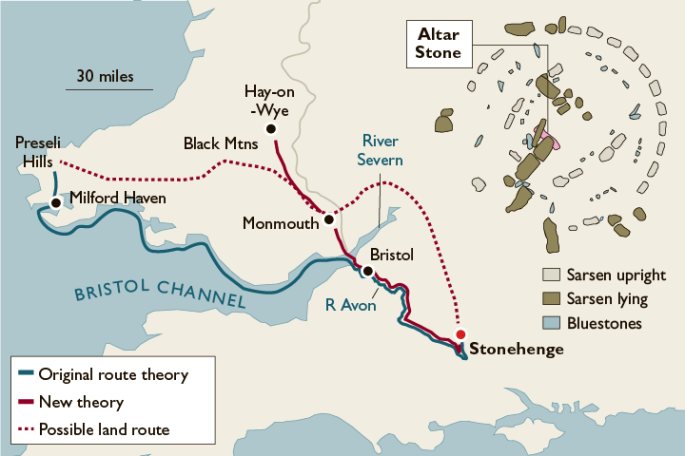 In the journal Antiquity, Dr Ixer and Dr Bevins say Thomas’s sourcing of the bluestones and Altar Stone, the basis of a sea route east towards Stonehenge, was based on “sloppy” work. The long-distance transport of the Stonehenge bluestones from the Mynydd Preseli area of north Pembrokeshire was first proposed by geologist H.H. Thomas in 1923. For over 80 years, his work on the provenancing of the Stonehenge bluestones from locations in Mynydd Preseli in south Wales has been accepted at face value. New analytical techniques, alongside transmitted and reflected light microscopy, have recently prompted renewed scrutiny of Thomas's work. While respectable for its time, the results of these new analyses, combined with a thorough checking of the archived samples consulted by Thomas, reveal that key locations long believed to be sources for the Stonehenge bluestones can be discounted in favour of newly identified locations at Craig-Rhos-y-felin and Carn Goedog. Source: https://goo.gl/images/3wq17q click to enlarge. Fascinating new paper out about the Stonehenge bluestones - "persuasively lays to rest the misconception that Pliocene or Pleistocene glaciers might have been responsible for transporting the bluestones to Salisbury Plain"
"The geological and archaeological evidence from Carn Goedog, and the results from Craig Rhos-yfelin, have firmly identified Stonehenge sources and Neolithic megalith-quarrying at those outcrops. This persuasively lays to rest the misconception that Pliocene or Pleistocene glaciers might have been responsible for transporting the bluestones to Salisbury Plain (e.g. Kellaway 1971; Williams-Thorpe et al. 1997). The dating of quarrying activity at both outcrops places the megaliths’ extraction from the Preseli sources within two or three centuries of the bluestones’ first erection at Stonehenge Stage 1"